Typhoon Soulik over the western North Pacific was located about 192 nm WSW of Sasebo,Japan and was moving towards the NW at 7 knots. Max winds currently estimated near 85 knots with hurricane force winds extending outward about 30 nm to the southwest and 40 nm to the northeast. Soulik will begin to turn more towards the north then northeast making landfall along the west coast of South Korea near Kunsan between 12:00 and 18:00 UTC on the 23rd with max winds of about 65 knots. 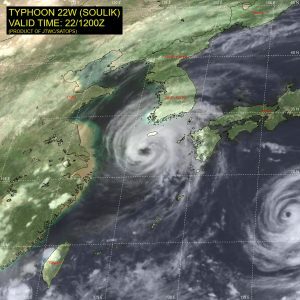 This entry was posted in Ocean Storms, Tropical Cyclones and tagged Hurricane Force, North Pacific, Soulik, South Korea, Storm, Tropical Cyclone. Bookmark the permalink.